Several years ago Brad & I moved from Saskatoon to Canmore. We rented a house online that we had never seen except in pictures, loaded everything we owned into a Uhaul truck, invited my then 23 year old son to join us and off we went. We drove through the worst storm of the year at the end of January 2006, a 3 vehicle convoy, white out conditions so you could not see the road for all the snow falling, and arrived 14 hours later (usually a 6 hour drive) in Canmore only to open the door to the most luxurious home we had ever been in. In the morning, we opened the door and were stopped in our tracks - literally, by the most awe inspiring view of the Three Sisters Mountains right in front of us. 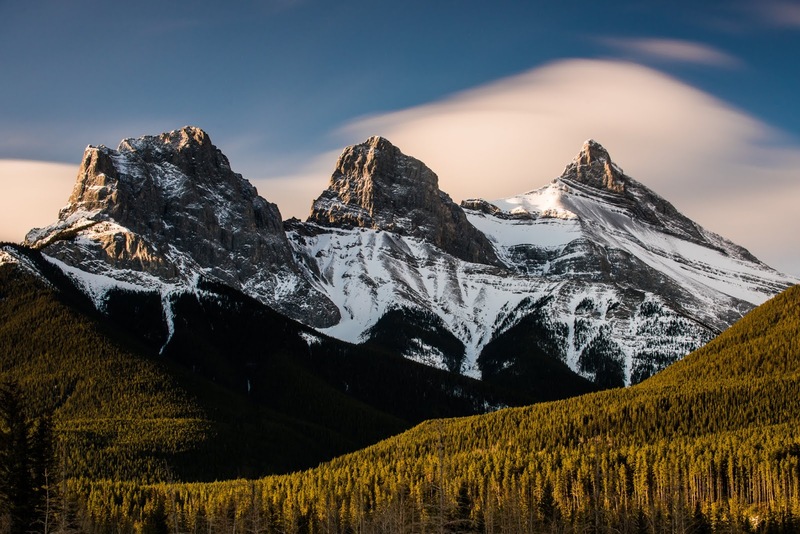 A few weeks ago Brad came across an ad for a Workamping position just outside Canmore. He sent an email and I later sent a proper resume and we received a cordial email advising that all positions were full. Yesterday morning we received another email that they would like to do an interview with us via Skype.. of course, we jumped at the chance. Apparently due to a family emergency one of the 5 hosts at this site has had to pull out. We were offered the position and we took it. Free Full Hook Up site and a bit of cash every month. 5 hours 3 days a week, 6 hours 2 days a week and 2 days off. The campground closes Oct 8 and with year end wind up we'd be free to head out around the 15th, which allows us just enough time to get to Osoyoos for our crossing - or we could cross south of Lethbridge into the beautiful Montana. This morning... in an hour we leave.... so excited. Having never Workamped before we are both excited and nervous for that aspect of this next adventure but thrilled to be heading back to Canmore. Yesterday was spent doing last minute running around and visiting with family who were surprised, but not shocked, that we were off yet again. We were surprised too, this position just came up out of the blue. We have paid for a month at this campground and have only been here 10 days... no refunds but they have noted our extra days so that we can come back anytime in 2018 and use them up. This is a great opportunity to get back to the mountains. We would like to eventually settle back in Canmore, but we've been leary of how it would be if we did. This job allows us to feel Canmore out after a decade and see if it still fits without paying the exorbitant prices that are Canmore Real Estate, only to find that 'you can't go back'. Canmore is an old mining town that had a boom and the original residents resent the 'newbies' so there is a bit of that to deal with in this town and it is a very transient community but we love the beauty of it. Hiking trails, mountain roads, Banff, Lake Louise, Mount Engadine Lodge (great lunches put on on the weekends and a beautiful scenic drive) and of course, old friends. Wish us luck on this new adventure. PS We have no idea what the internet will be like. Stay tuned for an update on that. Sounds like the perfect opportunity, especially since you know the area already. Wishing you the best of luck on this exploration adventure. It sounds like the perfect opportunity to check things out and getting paid is a bonus. Good luck with your workkamping experience. Hope you enjoy it! Well that is where things get complicated. We think now that Brad will fly out early Aug and put it all in storage until we can get there next spring - hopefully... or maybe we’ll fly him out and he can drive a van back. Still undecided. I've been to Canmore. Hope it is what you remember. Had a quick drive into town tonight, Calgary Dtampede is on so the tourists are many. More than usual. Got a few pics but it’s too crowded so I’ll try again in the week. So very happy for your guys! Thanks. We’ll ave to reschedule next months NSC meeting though. All the best with your new adventure. Always nice to go back to a place you love. Safe travels. Wow ... how exciting !! We were in Colorado Springs for a vacation so we didn't see your news!! Best wishes you two !! Just catching up with your blog. Wow, lots has happened. Congrats on selling the house. I imagine that's a HUGE weight off your shoulders. The workcamping job sounds great and in a beautiful area. Too bad the house closing (and packing and storing) happens right in the middle of it. Storing sounds like a good idea then when you have the time next year you can decide what to keep. We're getting our house ready for sale (in Ottawa) and purging is the hardest and most time consuming. We'll have a storage unit for the things we want to keep when we come off the road in a couple of years. Good luck! Thanks Judith, yes its been all fun and games and we just keep switching it up. Never a dull moment. Are you up to date or still have a bit to read? Yup all up to date. Those storms are wicked. I'm from Edmonton and I know those storms. We were driving back from Northern AB one year when a tornado ripped through. The sky was unbelievable (days before instant cell phone pictures) with crazy clouds and sheet lightening. Best light show ever. Good job on the vaping, it's a hard, hard habit to break.